This second wrongful death lawsuit filed against Patient First in a three-day span. This case also alleges that the decedent was improperly cleared for surgery. This case involved the patient's respiratory/pulmonary workup before a tonsillectomy and septoplasty. It was filed in Health Claims Arbitration on May 4, 2017, and it is the 210th medical malpractice case filed in Maryland this year and the second filed against Patient First in a two day period. Malpractice lawsuits against Patient First: look at other suits Patient First and get more details about getting records from this health provider and what you can expect when you sue Patient First. After two visits with the ear, nose and throat doctor, Drs. Gehris, Jordan, Day & Associates, a woman is recommended for septoplasty and tonsillectomy surgery. The woman's medical history included obesity, asthma, potential sleep apnea and a potentially deviated septum, and her examination revealed a moderate deviated septum, hypertrophy of the nasal turbinates, and dysphagia. The doctors at Gehris, Jordan, Day & Associates forwarded their orders for pre-operative testing to Patient First, the woman's primary care doctors. 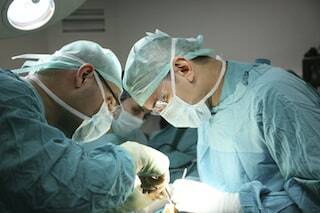 The pre-operative orders requested a history and a physical, an EKG, certain lab work, and that the results be provided to Gehris, Jordan, Day & Associates. As a result of the testing, the defendant doctor at Patient First determined that the woman required cardiac clearance before the surgery, and referred her to a cardiologist. After performing a dobutamine stress echocardiogram, the cardiologist reported that the woman's results were normal, but he expressed concern about her respiratory status, questioning whether "from a reactive airway standpoint, she would be an optimal surgical candidate." The cardiologist's report, including his concerns, were received by Patient First and the defendant doctor, as well as Drs. Gehris, Jordan, Day & Associates. Neither Drs. Gehris, Jordan, Day & Associates, nor the two defendant doctors at Patient First ordered or performed a respiratory/pulmonary workup or consultation for the woman before her surgery, despite the cardiologist's concerns about the woman's dubious respiratory status. At the SurgCenter of Bel Air, the woman was administered anesthesia and underwent surgery. After her surgery, the woman was taken to the Post Anesthesia Care Unit (PACU) at the SurgCenter. Over the course of the five hours the woman spent in the PACU, she was placed on an oxygen saturation monitor, administered Dilaudid for pain, and administered albuterol. Even though the woman's oxygen levels would drop while she was asleep, she was using "IS" to maintain her oxygen levels, and she was noted to have decreased breath sounds and slight wheezing in the upper lobes of her lungs, the defendant doctor recommended that she be discharged with a prescription for Percocet and instructions to sleep upright in a recliner. Although the woman and her family followed the postoperative instructions, the woman's husband found her unconscious and pulseless early in the morning, after less than 24 hours at home. Tragically, the EMTs were unable to revive the woman and pronounced her dead. The report of the woman's cardiac testing, including the cardiologist's concerns about her respiratory status for surgery, had been scanned into the woman's electronic medical record file maintained by Patient First. Therefore, the cardiologist's concerns were available to all of the woman's health care providers at the Patient First facility. Septoplasty and tonsillectomy procedures are typically low-risk. The complications in this case resulted from the woman's respiratory status, unrelated to the specific surgical procedure, but affected by the surgical process itself. It is important for doctors to understand a patient's respiratory status before a surgical procedure because anesthesia uses certain pharmacological agents, such as neuromuscular blockers, that impact the way respiratory muscles function. Sometimes the effects of anesthesia on a patient's respiratory system can continue for a considerable time after the operation is over. Likewise, surgery and/or sedatives can influence respiratory muscle performance by affecting their neural structures. If surgery does cause dysfunction of the respiratory muscles, it may lead to reductions in vital capacity, tidal capacity, and total lung capacity. In this case, the woman's oxygen saturation levels were fluctuating after surgery, and she was having decreased breath sounds and slight wheezing in the upper lobes of her lungs. Yet another Patient First malpractice suit filed in 2018. This lawsuit alleges that an intermuscular injection was improperly administered causing CRPS.